Fire Projects has done successful installation of GST C-9104 Conventional Ultraviolet Flame Detector, which is non-addressable fire detection device. Together with an active end of line unit (AEOL), it can be connected with compatible control panels to build fire detection system. It shows fire alarm by LED Indicators and transmits the fire signal to the control panel. GST C-9104 detects fire by analyzing ultraviolet radiation of material flaming. It's applicable to places where may have open fire, fire with intense flame radiation and fire without smouldering stage, as well as places where quick response to a fire is required. 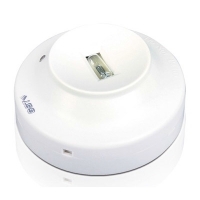 Fire Projects recommend to install GST C-9104 UV flame detector along with smoke and heat detector, which gives you complete solution in conventional fire alarm panel. Where flameless fires are expected. Where thick smoke spreads before flames. Places where the "view" of the detector is easy to be obscured. Where the sunlight can directly or indirectly reach the detector sensor. Where there are strong ultraviolet light source, such as halogen and tungsten. Where there is open flame, welding operation, X rays and arc and spark etc. Select Fire Projects to design solution of fire alarm system using GST C-9104 conventional ultra violet (UV) flame detector. We support our clients from Designing up to Commissioning up to AMC. We also provide AMC–Annual Maintenance Contracts for all types of Fire & security Systems. Contact Fire Projects today to schedule your appointment, Make call to Fire Projects on contact number +91 9409535460. Indicator: Red. Flash in standby condition. Illuminates steadily in alarm. h: Height from the detector to the ground.